Water is one of the most beautiful and oft discussed of the natural forces. It has inspired countless songs, poems and literature and is vital to all natural life - simply our planet could not survive without it. It is, however, one of the most powerful and deadly forces we can encounter. Annually thousands of people across the globe drown in anything from the mighty oceans to their own bathtubs. Working in and enjoying many natural places brings with it an ever present danger from water. 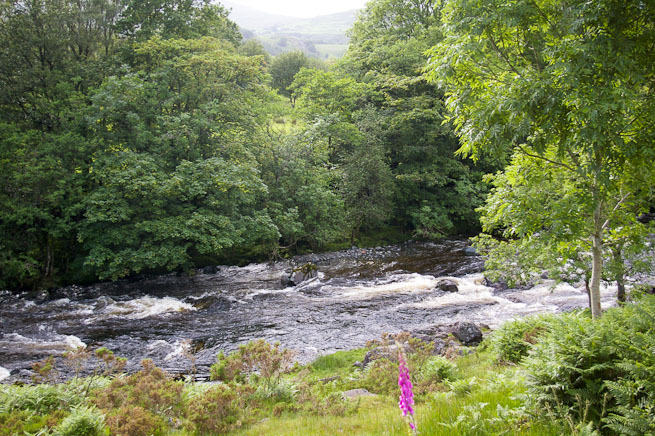 If we do anything outdoors we must understand the dangers of water and how to combat them. This will form the first in a series of articles looking at the dangers of water and how to cross such obstacles. Bear in mind that people slip on greasy and wet surfaces on the sides of water all the time so be prepared for this and have suitable safety precautions in place. Should the worst happen and a member of the party falls in, there are several things that must be remembered. First, the shock of cold water is often underplayed but should someone swallow sufficient water in this naturally occurring ‘shock’ phase it can kill rapidly. When this cold water shock happens remember that it is an entirely normal process and will pass within a minute or two so try to remain calm and ensure your head stays above the surface. If swept away keep your feet up at all times. The chances are the underwater bed of the river is similar to the broken rocks - with trip hazards and holes to trap feet - that line the edges of the water. 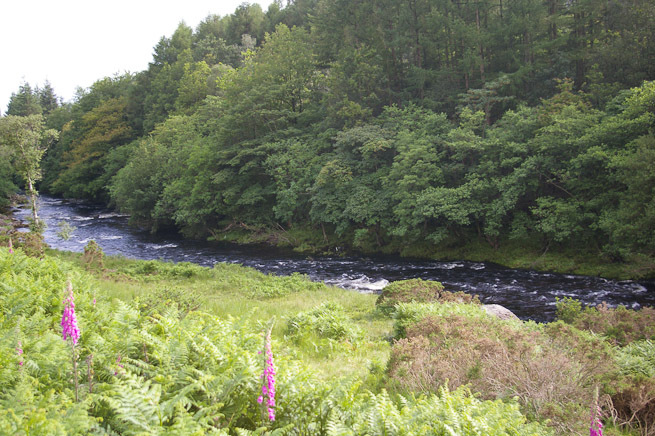 The underwater bed of the river is likely to be similar to the broken rocks - with trip hazards and holes to trap feet - that line the edges of the water. Photo: James Bath. 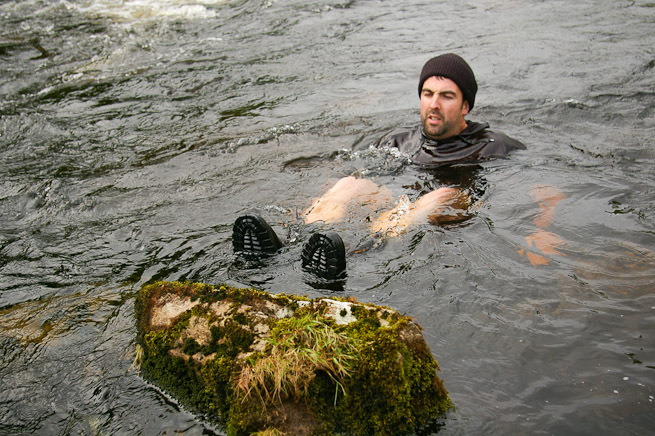 Should you put your feet down in the river whilst swimming you can easily get trapped and possibly drown. So always keep your feet up and together if you can. Keep your knees bent so you can absorb being pushed onto any large rocks and spring off and round them. Keep your arms out to the side as a kind of fin to help steer and by back-stroking you will slow down slightly. Remember arms and hands can get trapped too so keep them high in the water. Keep your knees bent so you can absorb being pushed onto any large rocks and spring off and round them. Photo: James Bath. Watch where you are going and remain on your back. 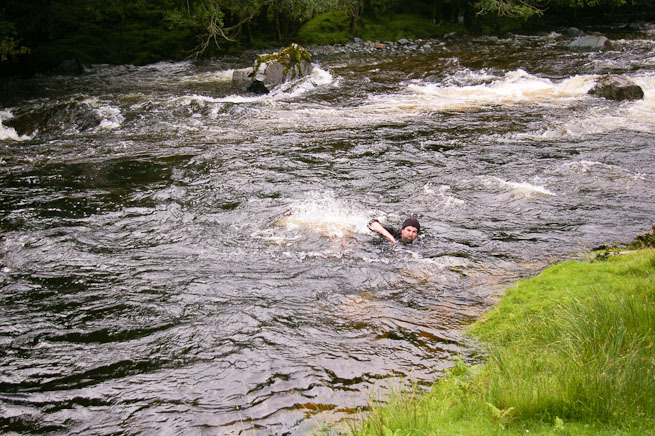 When you get near an eddy (a recirculation of water where everything slows down and floats back up stream) created by a small bay, rock or headland on the river bank sprint in front crawl as hard as you can aiming for the top, or upstream area, of the eddy to get yourself out of the water. When you get near an eddy, sprint in front crawl as hard as you can aiming for the top, or upstream area. Photo: James Bath. Being cold and wet take care not to slip again and take another swim on the way out. It is a naturally occurring trait of human kind to help another if in trouble. Seeing a colleague or friend struggling in water can be incredibly distressing but it is imperative not to act rashly in such situations. I have pulled people from all sorts of watery conundrums from a simple slip from stepping stones to struggling swimmers in cold deep water. Draconian as it may sound every rescue was only implemented after I was certain I would not become a casualty too – remember to always put your own well being first in such circumstances. Of a less dramatic nature if a member of a group goes for an unwanted swim you, as a rescuer, may be much more useful on dry land as a warm, dry, useful aid when they manage to exit the water by offering fire, shelters and hot sustenance. 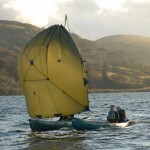 As a rescuer, you may be much more useful on dry land as a warm, dry, aid when they manage to exit the water (wet and cold). Photo: James Bath. One thing to mention at this point is the danger of ropes and water. Outdoor literature concerning river crossings often discusses the merits or issues surrounding the use of ropes as aids to crossing water. By bringing ropes into play the level of danger rises dramatically in this kind of scenario. Basically unless you are highly trained and have no alternative then leave the ropes either at home or in your pack. Sod’s law dictates that a rope will always snag or coil round some unseen object. Always. Something as simple as a loop of rope over an ankle or wrist will drown the most competent person in water. If you have to use a rope to rescue someone in the ‘drink’, never stand down stream of the rope; never wrap the rope around hands or wrists for extra purchase and watch where you put your feet with regard to coils. The aim of the above words is not to scare people away from the outdoors. Assuming that the reader enjoys time outdoors and in wild places you are, at some point or another, going to come across water obstacles. You should not fear such obstacles but respect and learn as much as you can about them. In the next article in this series we will look at how to evaluate the specific risks faced should we decide to commit to a water crossing. This is sage advice and potentially lifesaving. Many years ago I had an unfortunate experience in a mountain river. The cold shock knocked the air out of me and I clearly remember, nearly thirty years later, sinking like a stone into deep dark water. I was also being swept towards a rocky gully. It took a huge mental and physical effort to get myself out of the water and I still struggle with the idea of voluntarily entering cold open water any more than waist deep. I’m working hard to change this and articles like this are an invaluable aid. Good to hear from you and I hope you’re well? Thanks for your comment. Water can indeed be terrifying and I’ve worked with many people who have similar horror stories from their younger days. However, as you mention it is worth fighting such fears as water forms such a large, and beautiful, part of the outdoors. The best of luck with your work to change this. Great article, cracking set of legs as well James you must work out. Thanks but I’m not sure whether to be pleased or scared about the bit about my legs! Many thanks, James. A very useful article. I’d not considered the risks of using ropes. Very impressed with the safety advice. Last time we met you were complaining the showers were too hot. Glad to see you’ve cooled off since. Good to hear from you and thanks for your kind words. Take it from me – I did need a hot shower after that afternoon in the river. It was pretty chilly. Love the commitment shown in your writing. Good to hear from you and hope you’re well? Thanks for your kind words and I’m keeping my fingers crossed for you with regard to the weather later on. I am all to familier with fat moving water as i i fly fish the Vedder River here in BC. but got some good pointers from my friends, as you have explained here. There are about 6 times a year people get into trouble on the Vedder & sadly some die. Getting trapped under Log jams. About 4 years ago a young girl tubing down the river got stuck on a log jam and could not cross, she was crying & scared. So dropped all my gear & i knew the way around to the most safest crossing. It took me about 10 minutes to get to her & i took her out with me & safly crossed up the river. A hug & kiss was my reward & off she went, lol. Sounds scary for the young girl. I’m sure that’s something you will both remember forever. Water has a very scary ability to make anyone feel pretty small and completely useless. Good effort helping her out though. Im just used to Paul posting, & stupid me assumes it was him, bugger 😉 lol. Whole lot of sense, and very useful thanks. PS I’m coming back to your course next year, I hope! PPS I note with interest the photos are accredited to you. I know you have incredible skills, but how did you take the pics from the river? How’s the hunt for the ember going? Nice article, some good points to bear in mind there. Thanks for that and hope you’re well. I haven’t seen this covered very much in any survival Manual. As a matter of fact the only place that I have ever heard anyone cover this sort of thing is in a swift water rescue class. Good stuff. 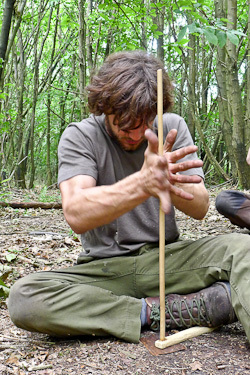 You’re absolutely correct – you very rarely read about water in depth (no pun intended) in survival/bushcraft/outdoor literature considering just how important and deadly it is. 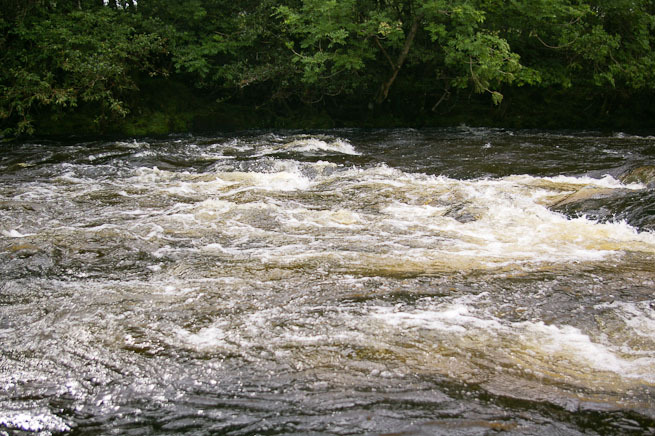 Obviously there are some good bits out there but to get in depth training and understanding of the subject you have to spend time in and near water – as you suggest on a swift water rescue course is ideal. Excellent article as allways. 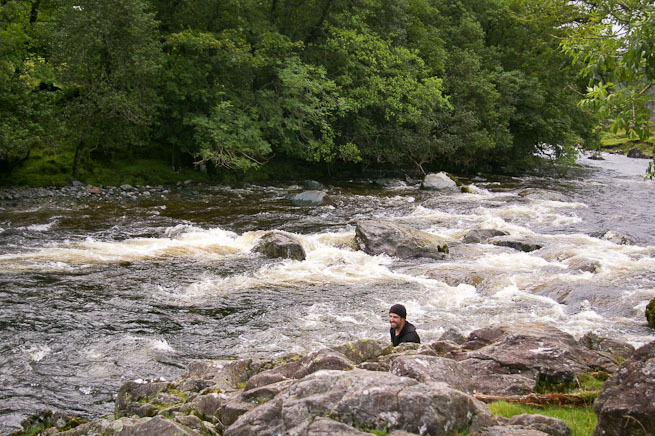 I got swept away in a river in scotland when i was 18. Oh what fun that was……not. This was a very useful article. 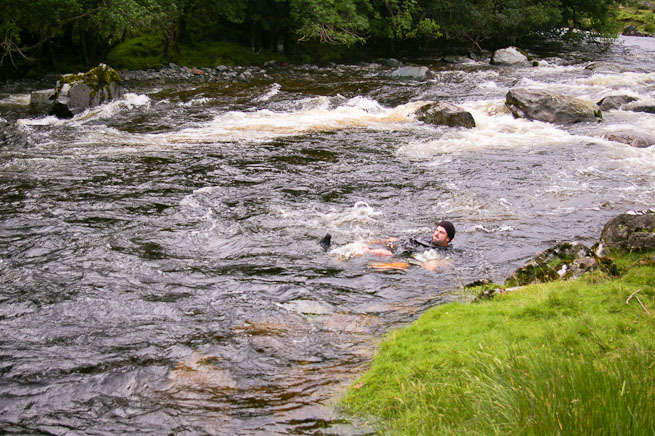 I wouldn’t have known about keeping feet up and proceeding to an eddy before trying to get oneself out of the water. Pictures were very helpful, too. Thanks for your comment. I’m glad you found it useful. I would add that, when defensive swimming, keep your bum up! My boss could hardly walk after getting that wrong, not a mistake he will make again soon. Apparently the bruise on his coccyx lasted for weeks, I laughed for the 3 days he couldn’t sit. Hi Paul, thanks for sharing this. Sadly, as mentioned previously, there is not much coverage of water safety in bushcraft/outdoor literature. Nice article James, well written and some useful information. I think all children should be taught, and encouraged to practice, swimming. All the best guys, Dave.